Newham Generals are an English grime duo from East London, currently consisting of MCs D Double E and Footsie. They are best known for their singles Frontline, Hard and Like It Or Not as well as their live performances. The group was founded in 2004, after D Double E had a disagreement with fellow members of his previous group N.A.S.T.Y Crew. Newham Generals built up a name for themselves through regular appearances on pirate radio stations and released a number of their singles on white label vinyl. Dizzee Rascal idolised D Double E as an MC in his youth  and the group was signed to his record label Dirtee Stank in 2005 after D Double E showed Dirtee Stank a CD of the groups work, and promptly released a mix CD on the label in 2006 entitled The Best of Newham Generals Vol. 1. Founding member Monkstar left the group in 2007. The group released their debut album Generally Speaking on Dirtee Stank in April 2009 which was their last release to feature Monkstar. They followed Generally Speaking with the release of the Bag of Grease EP the following year, as well as various solo projects. 2015: N to the G's"
DJ Tubby and Footsie ran their own record label Braindead Entertainment from 2002 to 2007 through which they released their own instrumentals. Footsie revived the label in 2012 to release his first solo vocal EP Zoot Break 2, this was followed by a joint instrumental EP with DJ Tubby entitled The Gray Area and by a 3 volume instrumental album series called King Original. 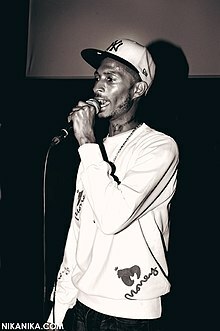 D Double E has appeared as a featured artist on numerous releases as well as having released singles and a solo EP on Dirtee Stank, he also founded his own record label Bluku Music in 2014. Over the years he has featured on a number of prominent releases such as Skepta's "Ladies Hit Squad" from the 2016 album Konnichiwa alongside A$AP Nast. ^ Thompson, Ben (15 February 2009). "Flash forward". The Guardian. London. ^ Chris Campion. "A look at grime music". the Guardian. ^ "Monkstar's the father... Hyperfrank Hyperfrank - Hyper About Grime". Hyperfrank.blogspot.co.uk. 2007-06-12. Retrieved 2015-03-02. This page was last edited on 28 March 2019, at 05:25 (UTC).